Here's Tom with the weather...: What Next For England? 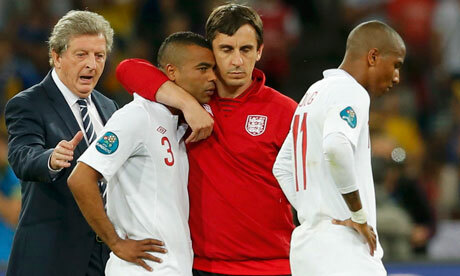 Having taken charge of Fabio Capello’s squad at short notice, what will the future hold for Roy Hodgson’s England team? Despite a respectable showing in Polkraine, the familiar failings which have blighted the national team were self-evident and the quarter-final exit depressingly familiar. Thankfully, positives have been gleaned from the tournament. Hodgson has quickly begun to implement a defensive system and a selfless team ethic, the squad has been united and harmonious, Steven Gerrard performed magnificently as captain and players like Andy Carroll and Danny Welbeck adapted well to the international game. Sadly, our familiar failings with regards to ball retention and passing played a huge role in our downfall. Rarely managing to string half-a-dozen passes together, there was never any hope of us troubling classy and cultured midfields like the Italians’ – let alone that of Spain or Germany. How desperately we missed the injured Jack Wilshere and the retired Michael Carrick. Thankfully there is hope in this area, with Wilshere to return and Tom Cleverley’s development to continue at Old Trafford. In defence, however, changes seem likely. If the John Terry race-case doesn’t result in his international retirement, he really ought to be put out to pasture. One of England’s major failings on this tournament was their deep defensive line – a line designed specifically to protect Terry’s alarming lack of pace. Although he defended heroically, his presence altered the team shape, stretching the pitch and forcing Gerrard and Scott Parker to play too far from the forwards to create effective links. As a result, Ashley Young was starved of meaningful possession and failed to reproduce his sparkling pre-tournament form. On the other flank, James Milner must surely have played his last game as an out-and-out wideman. Although he tramped diligently up and down the wing, he contributed nothing in an attacking sense, crossing woefully on the few occasions he worked an opening. England have options out wide in Adam Johnson, Theo Walcott and Aaron Lennon who, for all their shortcomings, are at least comfortable in the position. And what of Wayne Rooney? Gone is the dynamic tyro of 2004, replaced by a player seemingly incapable of beating his man and shorn of pace. He has certainly adapted his game at Manchester United, no longer the explosive presence he once was. His steady supply of goals seems to have disguised the truth: he is not the player we all thought he would become. Clearly he should still be in the starting XI, but he shouldn’t be treated as untouchable and shouldn’t carry the burden of expectation as he has previously: if anything we looked better without him in the team against France and Sweden. So, with a new qualification campaign on the horizon, we must trust that Hodgson can continue the team’s development. He’s already made it clear that the Euro 2012 squad was Capello’s team – the implication being that changes will be in the offing once has digested this summer’s football. Some of the squad will retire, others will be jettisoned or replaced. But Hodgson has done enough to suggest that, given a little time, he is the right man to incorporate the skill, composure and ability of Chris Smalling, Raheem Sterling, Alex Oxlade-Chamberlain and others into a team we can not only be proud of but also confident in.